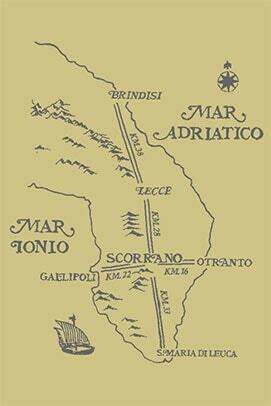 Our mission is to protect the wine heritage of Salento, the one of Negroamaro, Primitivo, Black Malvasia. This is how we make our wines, from native grapes vinified in red, rosé and white. All mono varietal and organic certified, produced with expertise and sincerity, always looking for the best expression of our land, respecting the environment and the consumers. And this is because only a vineyard cultivated directly, without the use of synthetic chemical products, with risk, passion and hard work can give the right feeling and make it a “must” wine, frank and drinkable, symbol of the persons who produce it and respectful to those who consumes it. For more than a thousand years, olive trees have been part of our heritage, and in Scorrano, in a historic mill, we produce an excellent extra virgin olive oil, always indicating on the label the name of the historical varieties Cellina Scorranese and Ogliarola. Come and get to know our world, our food and wine, culture, history and the unique hospitality of Salento. 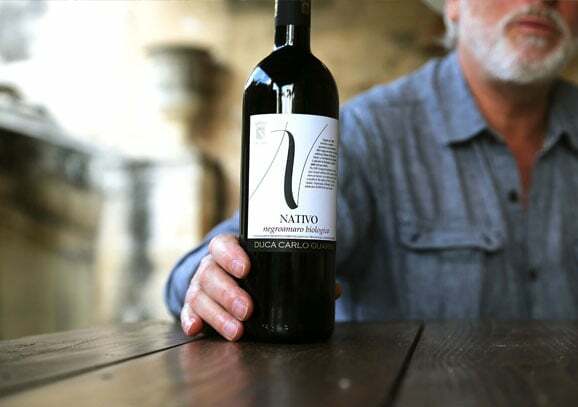 Our certified organic wines from native grapes, represent the tradition, such as Primitivo Vigne Vecchie that since 1985, is one of the first wines in Puglia to proudly have on the label the name of the grape; the reds Pìutri and Natìvo from Negroamaro and the rosé Campo di Mare; Malìa by 100% black Malvasia, that recreates an old family tradition of the late ‘800s to which Malìa Rosawas added in 2013, a very pleasant rosé from 100% black Malvasia. And then, there are the innovative wines as Taersia ,since 2013, a new and interesting expression of the historic red grape, Negroamaro, vinified in white and Piccolebolle, the first sparkling wine from Negroamaro vinified in white, using the Martinotti method, entirely produced in Scorrano, result of a specific cultivation technique in the field and a thorough work in the cellar. 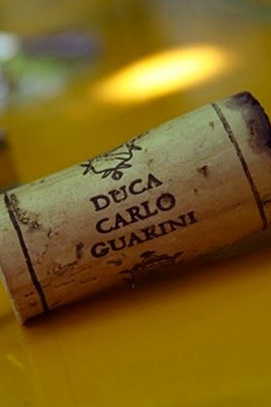 We are also proud to tell about our historic wines, talking about our ancestors and illustrious personages with whom we have had relations for centuries: the Primitivo Boemondo, dedicated to the Prince of Taranto and first son of Robert Guiscard, who chose Ruggero Guarini as his companion in the expedition to the Holy Land; the white Murà, from Sauvignon blanc grapes, in honor of Joachim Murat, King of Naples, who was a guest in our house of Lecce and engraved his Italian name on a mirror, and also the 900 Primitivo first produced in 2014 to celebrate the 900 years of winemaking and to remember our ancestor Accardo Guarini, Count of Valesio, who in 1114 already cultivated his vineyards in the Pìutri estate, between Lecce and Brindisi. The passito wines, Ambra from Sauvignon blanc and Rarum, the first in Puglia from Negroamaro and Malvasia Nera. A trip to Scorrano is an opportunity to discover the endless olive groves in our estates Lucagiovanni, Raostino, Colmuni, Guarini and Grove. They are ancient and majestic trees, over 600 years old, of typical varieties of the area, the Cellina Scorranese and Ogliarola. The accurate and innovative olive processing, immediately after the harvesting, the storage in stainless steel containers or in the old underground tanks, where the oil can rest in a dark, cool environment and decant naturally, allow us to obtain an extra virgin olive color, by the unmistakable aroma and taste. The extra virgin olive oil is one of the basic ingredients of the Mediterranean diet, delicious to the palate and a friend to our body: thanks to a high content of oleic acid, it protects the heart and arteries, prevents arteriosclerosis, slows down the brain aging, lowers the level of “bad” cholesterol and raises the HDL , the “good” one. 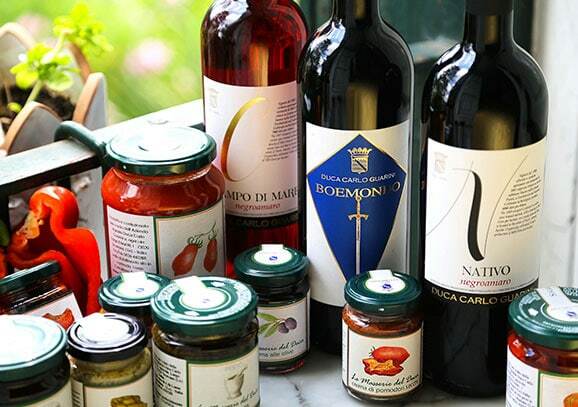 In the last few years we have created a distinguished and high quality farm-based food line, Le Masserie del Duca. From fresh cherry tomato sauces and ready to eat sauces, to cream of artichokes, olives, peppers, sun-dried tomatoes, onions and green apple; from stone less olives to semi-dry pickled tomatoes, hearts of artichokes, and turnips tops with chilly. Fresh vegetables, harvested and processed during the season, enriched with extra virgin and the Agrumati, oils flavored with citrus fruit, produced in our mill. And also, pear jam, white grapes and sweet potato, quince jam, jelly from Primitivo must, mustard from black Malvasia grapes, dried figs with almonds. Our vegetables and ancient grains, low-gluten content, are cultivated for not procuring allergies, that genetically modified cereals massively imported in Italy have caused in recent years.